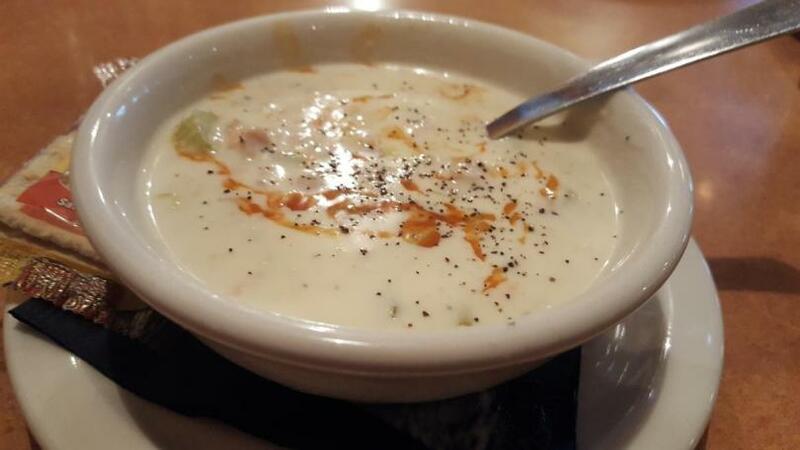 A cup of New England clam chowder at Rustico Ristorante and Pizzeria in Murrieta. 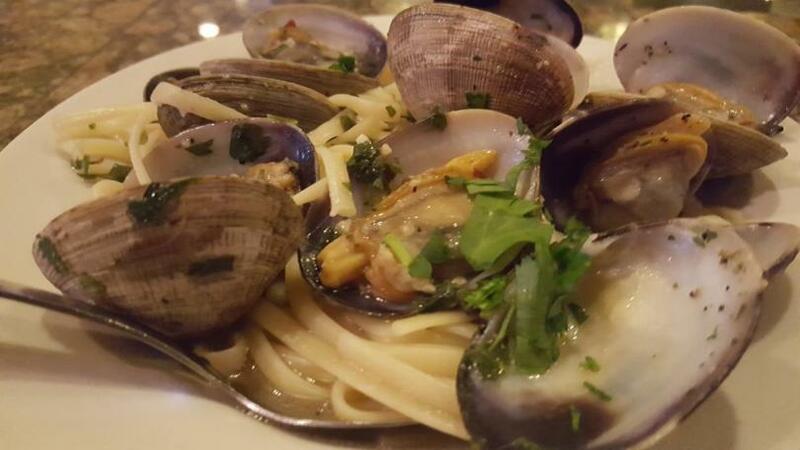 Linguini and clams in a white wine sauce at Rustic Ristorante and Pizzeria in Murrieta. My love for Italian food runs deep. As I was driving through the rain to Rustico Ristorante and Pizzeria in Murrieta two days before Christmas, I began imagining plates of lasagna, meatballs and pizza. Upon entering, I was quickly seated in a comfortable booth near a window. The lighting was dim, making for a calm and relaxing vibe, which I appreciated. The cheerful server brought over a small loaf of warm bread dusted with Parmesan cheese and dipping sauce consisting of olive and scallion oil and balsamic vinegar. The bread was hot and fluffy. The sauce was superb. The menu has plenty of options. I decided to start with a cup of New England clam chowder ($3 with entree). A bowl is $4.99. Other starter options include mushrooms stuffed with shrimp, walnuts, sun-dried tomato and Romano cheese served with a butter white wine sauce ($11.99), fried calamari ($10.99) and minestrone ($4.99). Before the chowder arrived, I perused the menu, unsure if I would go for pasta, salad or a pizza. Everything sounded delicious. The chowder arrived, and I added Tabasco sauce and black pepper before diving in. Though not an overly creamy concoction, it had everything I love in a great clam chowder – except for potatoes. For the entree, I ordered linguine and clams ($14.99), which comes with red, creamy or white wine sauce. I chose the latter. Knowing I would take most of it home, I also ordered the New Yorker pizza ($16.99), topped with pepperoni, salami, ham, bacon, meatballs and sausage. Entrees also include shrimp and zucchini risotto ($17.99), which includes fresh julienned zucchini and sauteed shrimp; lobster mac and cheese rigatoni, featuring four cheeses; pancetta and butter sautéed lobster tails topped with panko bread crumbs for $21.95; and of course Italian staples such as baked ziti ($14.99), lasagna ($15.99) and spaghetti with meatballs ($13.99). I spied the server with a plate piled high with clams and a stream of steam trailing behind heading for my table. The bowl was a sight to behold, with at least a dozen clams atop a heap of pasta swimming in broth. I went to work plucking clams from the shells before twirling the perfectly cooked linguine around my fork. The flavors were outstanding. I tasted a hint of roasted garlic, which paired well with the white wine sauce and clams. After I ate about half of the serving, the pizza arrived. At this point, I was already stuffed, but I had to try a slice of the meat-laden pie. It was delicious. I was worried the meats would create an odd collision of flavors, but they worked well together. The crust was delicious, with the right amount of crunch. The cheese was gooey and piping hot. I was too full for dessert, but options include tiramisu ($7), Rustico chocolate cake sundae ($9.50) and a Sicilian cannoli ($5.95). I brought the leftover pizza back to the office, and my colleagues said they enjoyed every bite. 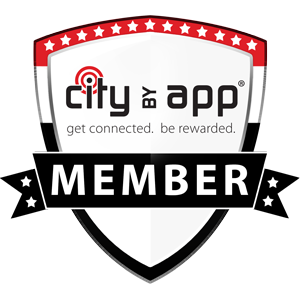 All dining profiles are paid for by The Press-Enterprise. Stephanie Schulte has covered everything from travel, crime, food and entertainment since 2006. Her first assignment was writing a feature story on Ray “Boom Boom” Mancini for Amy Blanc Elementary School in Northern California and she never looked back. Schulte enjoys playing piano (not very good), hiking, hanging with her family and friends and watching “Three’s Company” re-runs.